Perfect bakery style cookie recipe! 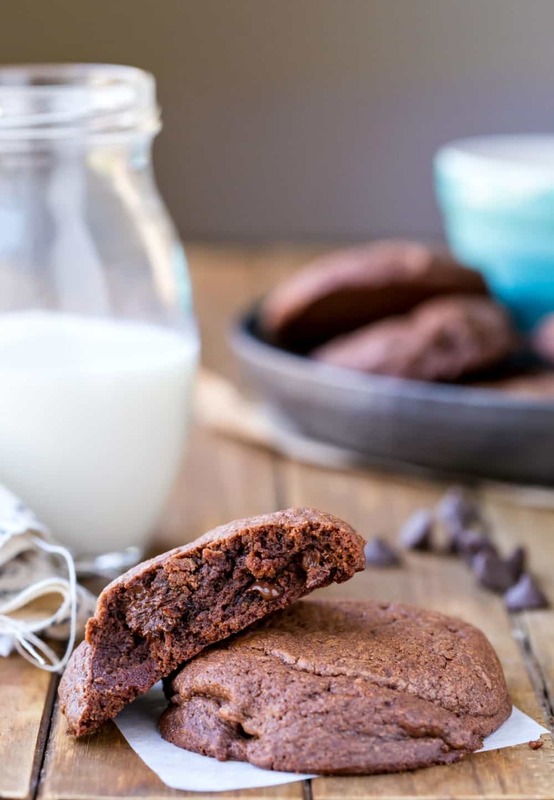 Bakery Style Double Chocolate Chip Cookies are thick, soft double chocolate chip cookies. These simple chocolate cookies are the best! Originally published 8/3/17. Updated with new tips and information 8/20/18. It’s no secret that I love a good cookie. They’re easy to make, the flavor combinations are nearly endless, and they’re delicious. So, there’s a lot to love about cookies. 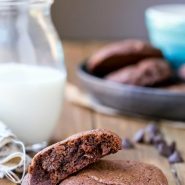 These Bakery Style Double Chocolate Chip Cookies are thick, soft double chocolate chip cookies. They’re a perfect quick fix when you’re craving chocolate! Can I use a different type of chocolate chip? I use semi-sweet chocolate chips because they’re my go-to for most cookie recipes, but bittersweet or milk chocolate would work instead. Since they start with cold butter, the dough keeps its shape well when baked – no chilling needed. It also means that this is a great recipe to make when that cookie urge strikes and you don’t want to wait for the butter to soften or the dough to chill. How long will double chocolate chip cookies keep? These cookies are best eaten within the first 2-3 days after they’re made. More chocolate chip cookies recipes! 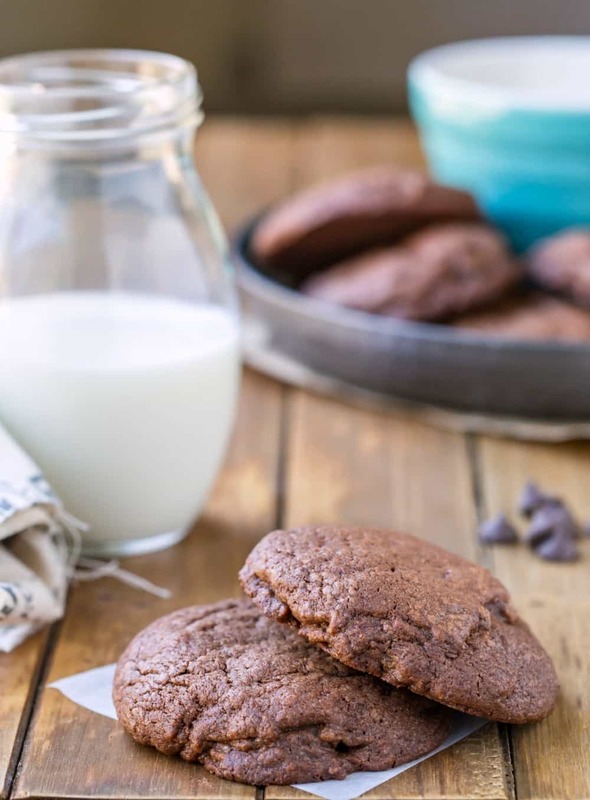 If you’ve tried this bakery style double chocolate chip cookie recipe, don’t forget to rate the recipe and leave me a comment below. I love to hear from people who’ve made my recipes! You can SUBSCRIBE to receive my latest recipe newsletters or FOLLOW ME on FACEBOOK, INSTAGRAM and PINTEREST for even more delicious food. Bakery Style Double Chocolate Chip Cookies are thick, soft chocolate chocolate chip cookies. Preheat the oven to 350F. Line baking sheets with parchment paper or silicone baking mats. Beat butter and sugars together until well-combined, about 2-3 minutes. Mix in the eggs one at a time, scraping down the bowl as needed. Add vanilla extract, and mix to combine. Add the cocoa powder, flour, salt and baking powder; mix until just incorporated. Scoop dough in 1.5 tablespoon scoops (medium cookie scoop). Roll each scoop of dough into a ball and flatten slightly. Place on baking sheet about 2 inches apart. Let cool on the baking sheets 5 minutes, and then transfer to a wire rack to cool completely. You have a recipe for Bakery Style Double Chocolate Chip Cookies and Chocolate Chocolate Chip Cookies. I can see the difference in ingredients but what is the difference in the final cookie or why might I like one over the other? The bakery style double chocolate chip cookies are thicker, and they’re more of a soft almost cakey cookie. The chocolate chocolate chip cookies are thinner and chewier. I hope that helps! If you have any other questions, please feel free to ask. So good! These cookies are really delicious! They put my usual bakery to shame. What is the calorie count and othe nutrient information on this cookie? Do you know? I’m looking to see how “healthy” a cookie it is to eat. I’m not trying to be smart, I really have to watch for a member in my family.